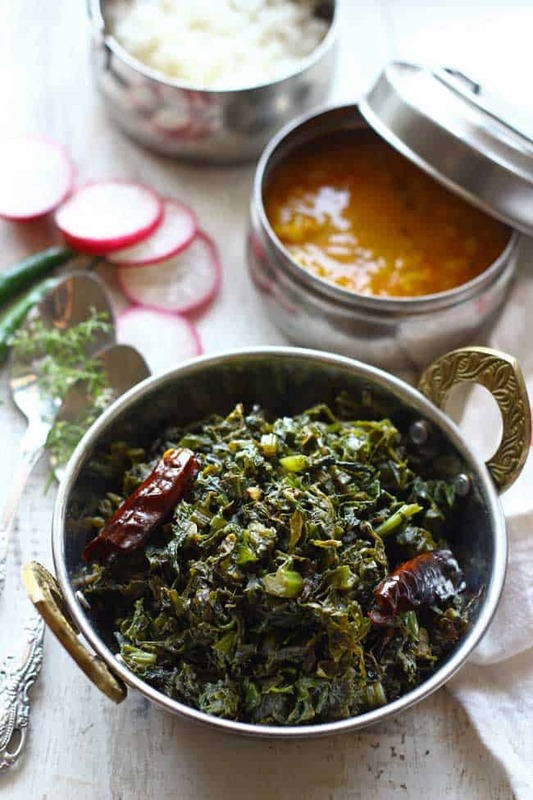 Pahadi Lai Ki Sabzi is the simple stir-fry of a local variety of mustard greens. This particular variety of mustard greens has a sharp, saline taste to it with the shades of red on the leaves. The color of leaves is not entirely red so I am afraid if we can categorize them as red mustard leaves. These leaves have a peculiar mustard oil like aroma to them. 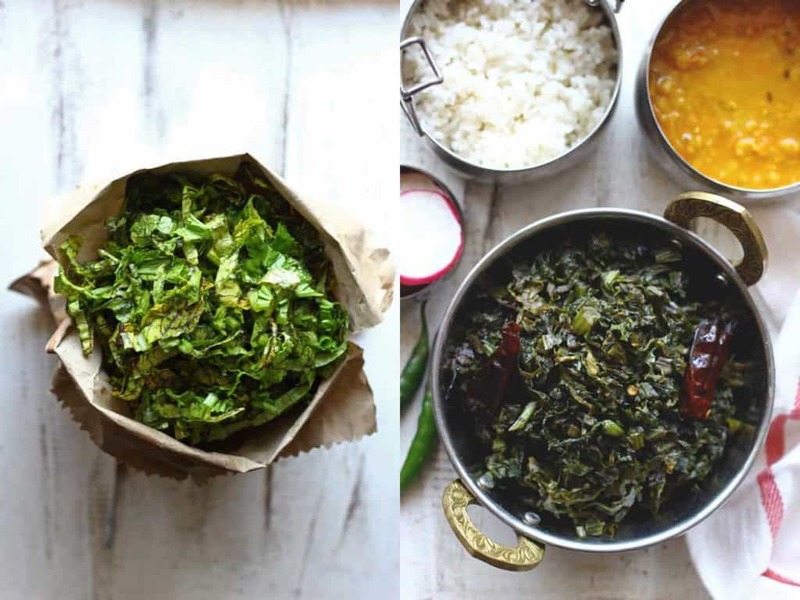 In the local Kumaoni dialect, we call this variety of mustard greens Lai. Its is usually available throughout the winter season. And we surely miss relishing it while the rest of the year. 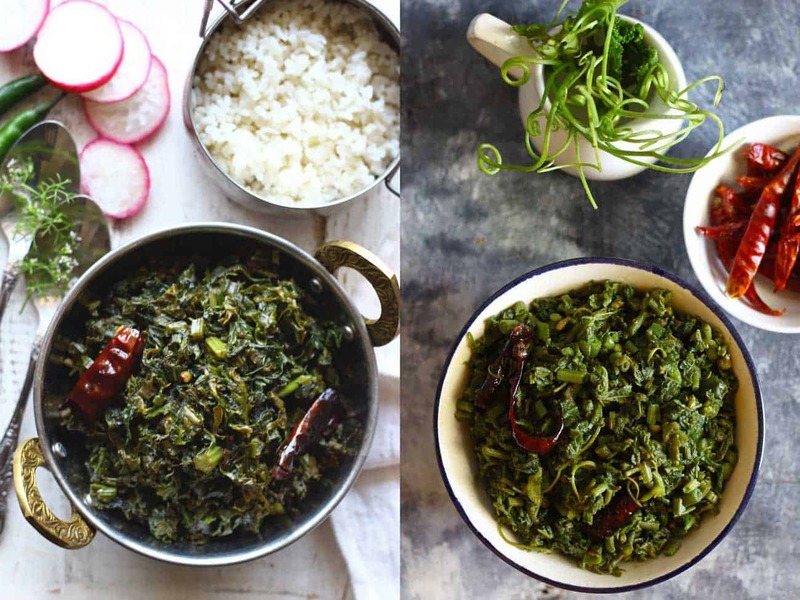 But few things taste best in a particular season like Sarson Ka Saag. Lai Ki Sabzi has an uncomplicated demeanor. So easy to prepare yet full of fresh flavors. We have this soft spot for the green leafy vegetables especially the local ones. They provide a wholesome, flavorsome, quick side-dish. There is a kind of unsaid comfort in relishing green vegetable stir-fry with the hot chapati, paratha or with simple dal-rice. This winter our green love is at the pinnacle and we are surely making most of the local green leafy vegetables available in the market. 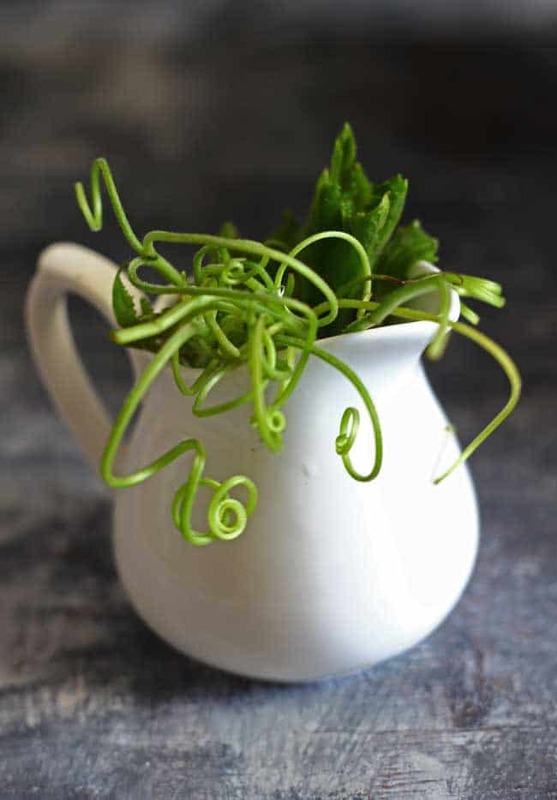 Even on the Pinterest, we have started this board called – Green Recipes Revolution to collect best green recipes from all over the world. Isn’t that exciting? This is one of the few personal projects we are looking forward to in the year 2017. There is nothing fancy about the green recipes like Lai Ki Sabzi or Palak Anda Curry, but I’m telling you, they are truly delicious. It’s fresh, it’s filling, it’s full of great flavor, and it’s made with all sorts of ingredients you can feel great about in the new year. 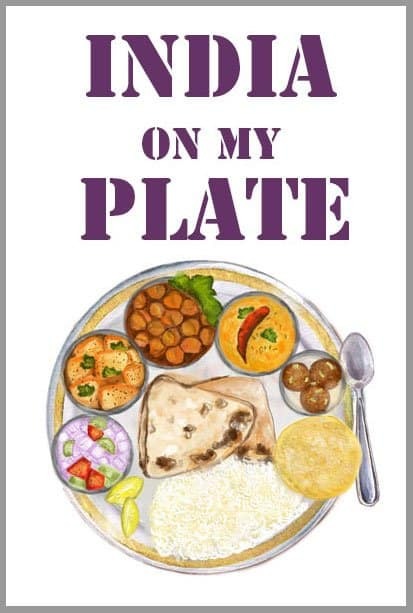 So if any of you happen to be looking for a tried-and-true recipe for authentic Pahadi Lai Ki Sabzi, this one might come handy. And you can rest assured that they’ll be happening in my kitchen again this week, and next week, and probably till the time they vanish from the market until next season. Learn how to make Pahadi Lai Ki Sabzi with this quick and easy recipe. And enjoy the winter bliss! 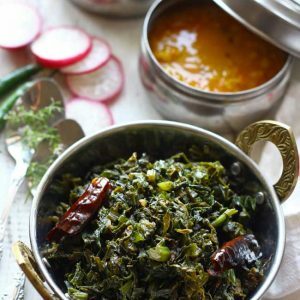 Pahadi Lai Ki Sabzi is the simple stir-fry of a local variety of mustard greens. Find how to make red mustard green stir fry in few simple steps. Remove the tough stem from the base of greens. Wash the leafs in water twice or thrice to make sure they are absolutely clean. Chop the greens into very fine threads, finer they are cut tastier is the dish. Heat oil in a thick bottom wok ( buy it here ) over high heat. Once the oil reaches smoking point, reduce the heat to low. Add the dry red chilies. Fry for 10 second or so. Add asafoetida and cook for few seconds. Now add the chopped greens, stir to mix. Add salt, turmeric and red chili powder. Mix nicely and cover the wok ( buy it here ) with a lid. Allow the vegetable to cook on low flame till the greens turn soft. It will take 10 -12 minutes. Stir the vegetable at regular intervals to avoid getting burnt. There should not remain any liquid of the greens in the wok. Do not cook the greens for too long. 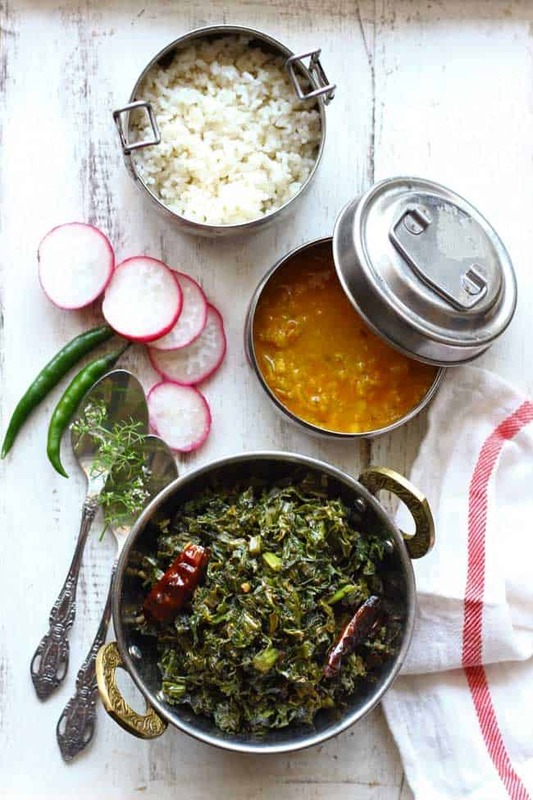 Serve Lai Ki Sabzi warm with arhar ki dal ( see recipe ) and rice. Red Mustard Greens already have some sort of saltiness to them. It is recommended to use less than usual salt to season the vegetable. Best taste the vegetable while cooking and add more salt if required. Giveaway Announcement: We started the year on the blog with a giveaway announcement for our readers asking them about ‘the most cherished lunchbox memories’. And we surely have a winner. The winner is Ms.Nafia. We loved another entry so much that we decided to give one more prize and that entry is of Ms. Akanksha Kapoor. Congratulations to both the winners!